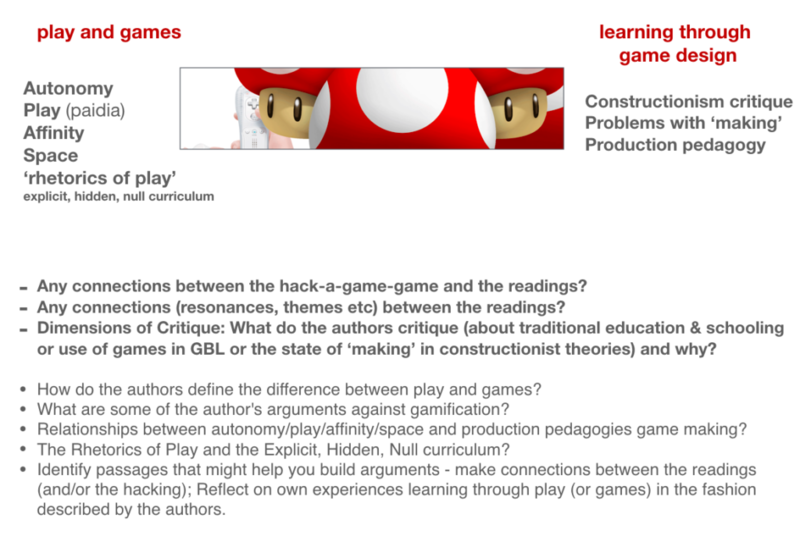 Write a critical/analytical piece (formal style) that – based on the readings and game-hacking – articulates (and evaluates) some connections between the authors’ critique/s of gamification and schooling/education and the transformative opportunities of play, (some) games-based learning and game making and/or a learning driven by ‘serious play’. Expectations: Support your discussion or ‘thesis’ with quotes from the reading(s) and try to connect the theory in the readings to 1) your own experiences learning with/in and through ‘play’ (paidia) or ‘good’ games, and/or 2) significant learning-through-making in the key of ‘serious play’ (which may not have anything to do with games or formal schooling). Feel free to hack/mod the suggestions above if you see a better way into this production, or another strategy for engaging the course readings and activities this week. But you must engage the readings (address and unpack key passages, argue with the authors, etc etc etc). Due by Thursday (400-500 words min).